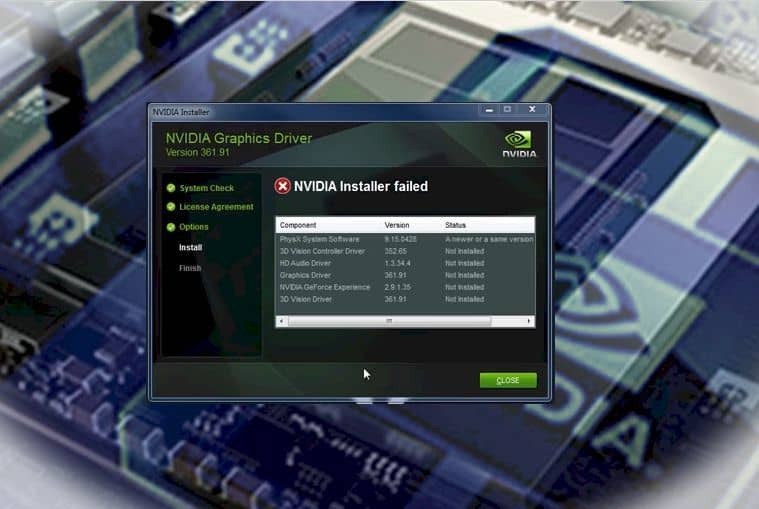 If you’re one of those who recently upgraded to Windows 10 or recently updated your hardware, you may get the error that your NVIDIA installer failed. In a nutshell, an NVIDIA graphics driver is a software that allows your hardware to communicate with the rest of the system. For gamers out there, whenever you install a new game on your PC, you may have to update your graphics drivers to ensure that you get high-quality image resolution. ​There are a few possible reasons why users such as you may get this problem or error. For PC geeks and computer gamers, you may be well aware of this issue that you aren’t afraid anymore. However, for newbies who suddenly get this issue, they start to panic and feel that they have done something wrong. Well, don’t despair because there are valid reasons why this happened. One of the reasons is when you recently upgraded your OS (operating system) to Window 10. As you upgrade your system, Windows updates the GPU drivers running in the background. Depending on your connection, this update takes a few minutes, probably 5 to 10 minutes on average. However, if the driver fails to update, it tells you that “NVIDIA Installer Failed.” Sometimes, just restarting your PC does the trick. Another reason is when you installed a graphics driver in the past which caused the NVIDIA driver to fail. The files saved on the PC may be conflicting with the update. That is why you need to remove these files. Third, there may be an issue with your software. Run the Device Manager and search under “drivers” for those yellow exclamation marks. Those marks tell you that there is a problem with the system and you either need to reinstall them, disable, and re-enable. Fourth, your firewall or antivirus may be interfering with the update. As you update the NVIDIA driver, your antivirus “thinks” that a virus is trying to get in the system. It would be best to disable this temporarily. Just be very sure that you don’t download from shady third-party websites; otherwise, your system might get infected by a virus. Lastly, your Windows OS might be corrupted. This is why you need to reinstall it properly. Before proceeding to the fix, double check that your Windows OS is updated and that your hard drive has enough memory. The NVIDIA page shows you warnings that you need to update the driver. Check for the warning corresponding with yours and update as needed. You can use another software, such as Driver Easy, to help you update the driver. This error may be caused by an incompatible driver in your system, so you just need to update it. You can also go to NVIDIA’s page and download the updated driver from there, or download it from a download utility website such as CNET. Ensure that you select the correct details when you download the driver such as Product type, series, model, and Windows OS. After updating the driver, you need to restart your PC to refresh the system. Another reason why you may be getting this error is due to background programs that are not running correctly. You need to end specific NVIDIA processes by accessing Task Manager. Do this by pressing the CTRL – ALT – DEL keys simultaneously. Some antivirus programs and firewalls wreak havoc into your system and cause the error “NVIDIA installer failed.” Examples of antivirus programs that may be incompatible with the NVIDIA driver are AVG, Comodo, and FortiClient. You need to temporarily disable or close the antivirus software before you update or reinstall the NVIDIA driver. To do this, press and hold the CTRL + ALT + DEL keys until the Task Manager appears. On the processes tab, look for the antivirus program and click on “End Task.” Restart your PC so the changes will take effect. After successfully reinstalling the driver, enable your antivirus again to prevent attacks on your system. If all else fails, you may need to reinstall your whole Windows OS. Most likely, some corrupted Windows files are affecting the NVIDIA installer. Keep in mind that reinstalling your Windows OS means wiping out all information from your PC. Therefore, it is crucial that you back up or make copies of all your important files before performing the reinstallation process. After finishing the re-installment of the Windows OS, you may reinstall the driver. PC errors cause panic especially if you are unaware of them or have little technical background. If you are uncomfortable in updating your drivers, it would be best to take your PC to a licensed computer professional to have it fixed. They can also diagnose other problems that your PC may have. If you attempt to fix them on your own, make sure you have ample information. Research the steps, write them down, and make sure to search for alternatives in case one solution does not work. Always check if you have backup files, too. Ensure that all essential drivers such as Windows OS, hardware, and software drivers are available before you perform a clean sweep of your system. Also, if you are a gamer and have a habit if installing games with high-quality graphics, make sure you keep your hardware and software updated. Sometimes, not having an upgraded system causes your system to slow and cause errors. There you have it! Whenever you encounter the “NVIDIA failed error,” don’t forget to follow one of the solutions above. Write them down or print them for future reference.